When we first moved to St. Louis, I was perplexed to see commercials on TV all the time for agricultural products—commercials that talked to farmers about “higher yields” and later “roundup resistant strands” and so on. I mean, this was St. Louis, a relatively large city, and yet I saw more commercials for agricultural products than I ever had visiting the rural areas of Oklahoma where some of my relatives actually WERE farmers. Why were we seeing ads for this kind of stuff in the middle of a relatively big city? After all, I had grown up in a decent-sized city, but it was one where on Saturday you knew not to get out on the main streets before noon, because all the farm folks would be creeping on the roads as they nervously navigated the “terrible traffic of the big city” in their words—which meant anything more than three cars at a stoplight. To me, St. Louis was a manufacturing hub—a place that was known for beer—we saw plenty of ads for that too—and aircraft and the Ford and Chrysler plants. I mean, sure, there were farm fields in the outstate areas, but it just seemed weird. Then I learned about Monsanto, and Queeny Park, and St. Louis’s connection to agribusiness. It all made sense, but even for years it still made me wonder how many St. Louisans actually paid attention to those ads at all, given how foreign life on a farm was to most suburbanites. Maybe those ads caught my attention because I knew farmers, and rural people, even growing up in a smaller city like Tulsa. My kin lived in small towns surrounded by fields of soybeans, and winter and summer wheat, and corn. My grandparents at one time were sharecroppers, and my grandmother bore the scars on her hands from picking cotton in the hot sun with a pair of babies strapped to her back, and I had cousins who sill grew cotton and raised cattle. I knew farmers—their incredible work ethic, rarely taking a day off, their deep connection to the land, and especially their abiding sense of community, which only made sense if you thought about the fact that their neighbors weren’t people who you only saw when you pulled out of your driveway on the way to work, but were often people whom you worked alongside for generations. I remember once my Uncle Glenn was driving me through the rural roads in southern Oklahoma when he pointed out a farm field—which looked to my untrained eye like any other field, what did I know? Mr. Abernathy, he said, owned this field, and he grew prize-winning corn. His fields were some of the most productive in a several county area. He constantly produced more bushels of corn per acre than anyone around. And yet, Mr. Abernathy was known far and wide that if someone got into trouble, and ran short of seed corn, he would be happy to give his neighbors some of his prize-winning seed corn. And so, Mr. Abernathy’s farm became kind of an epicenter of a network of farms that all grew amazing corn, even though his was always the best. I thought of that story as I was reading this line from the epistle to James: “Every generous act of giving, with every perfect gift, is from above, coming down from the Father of lights, with whom there is no variation or shadow due to change.” This has been a week when generosity and hard work has been on my mind for a number of reasons. In the month I have been with you, I have been amazed at your generous welcome and acceptance of me and my family. I have been blessed with the generous sharing of time, talent, and treasure by so many people as we work together as the community of St. Martin’s to witness to the core value of generosity. Every time I walk into the nave on Saturday or Sunday and see heaping baskets of produce grown solely to donate to people who might not otherwise have access to fresh produce, I see the generous, creative use of the resources of land, water, and labor that this parish has committed to for the sake of people that most of us will never meet. Every time I hear of you all supporting the Peace Meal, and making sure that the people who gather at St. John's Tower Grove get to take part in the table fellowship and community, I am proud of your generosity. 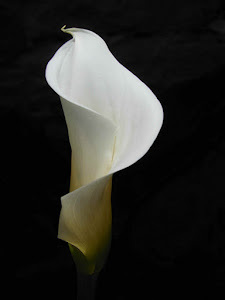 Yesterday, we had a funeral here for a non-parishioner, and yet so many people in this community, especially Wendy and Denise and the altar guild and the ushers and the facilities crew, pulled together to make sure that St. Martin’s could offer generous and abundant hospitality to the grieving family and friends of a gentleman none of us ever met. And all of you were involved in being able to give that gift of generosity, because if you didn’t provide the funding for this beautiful building, and for the electricity to cool and light it, to maintain what our bishop has admiringly told me was “the best parking lot in the diocese,” which is no small thing, we would not have been able to help that family in their time of grief. “Every generous act of giving, with every perfect gift, is from above, coming down from the Father of lights, with whom there is no variation or shadow due to change,” James is saying that generosity is one of the main ways faithful people embody the values of God, as we are called to do. The life of faithfulness is not just about belief, but about ACTION. “Be doers of the word, and not merely hearers who deceive themselves,” James continues. Faith is important—don’t mistake me. But unless faith produces the fruit of transformation of ourselves into people who live by God’s core essential values, it is worthless. I sometimes wonder if one of the reasons for many of the problems that haunt our modern society isn’t because we have fooled ourselves into thinking that we are all separate from each other. I wonder what would happen if the wisdom of Mr. Abernathy wasn’t more widespread. What if we all lived our lives emphasizing the fact that not only are we all interconnected, but that our interconnectedness is a blessing, and that taking care of each other in the end, besides being our calling from God, is in our best interest? 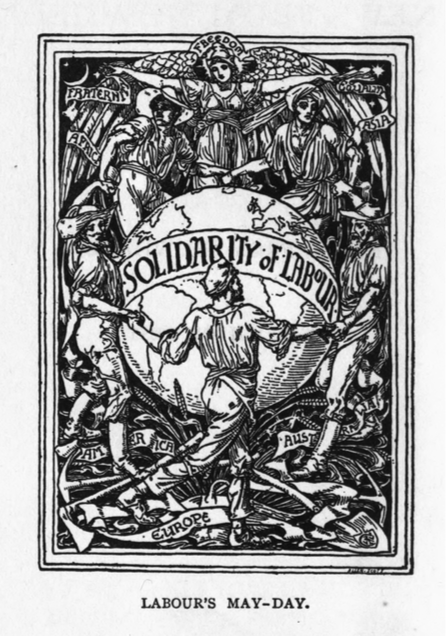 On this Labor Day weekend in which we celebrate the contributions that working men and women throughout the generations have made to our beautiful country, we also confront the fact that it is possible in this beautiful country to work one, two, and even three jobs and still not be able to earn a living wage. We confront the fact that every year, one of the main causes of bankruptcy for working and middle class people is medical bills—where they have had to choose life or health or crushing debt. And I think we as a society can do better than that. 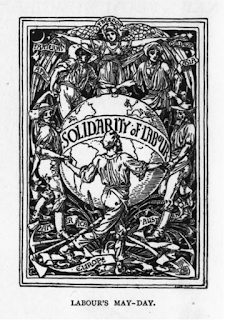 We celebrate the labor movement by getting a day off from our labor because they believe their slogan: united we are stronger, divided we are weaker. As we remember in our Eucharistic prayer each Sunday, God created each one of us in God’s own image. The practical effect of that is to remind us that we are called to embody God’s essential characteristics—it’s how we’re made. Qualities like forgiveness, and mercy. Being slow to anger. Being of great kindness. And not the least of those characteristics is generosity. The qualities and actions being extolled in our epistle and in our gospel today, encourage us to cultivate integrity—a sense of ourselves as individuals, yes, but also as member of a community grounded in love, cooperation, and mutual care. All of James’s advice—be quick to listen, but slow to speak, be slow to anger, putting away habits that hurt our relationships with each other in order to build each other up—is, in the end about integrity and generosity. And our model of integrity and generosity is Christ. 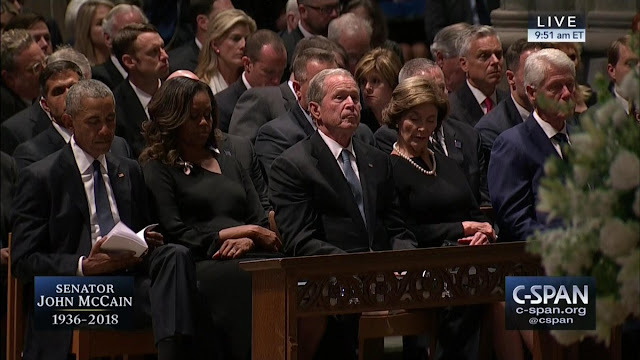 Yesterday, after the funeral here, I went home before the 505, and I watched recorded video of the eulogies given at the funeral of Sen. John McCain at the National Cathedral by both President Obama and President Bush. President Obama marveled at the generosity that Senator McCain had in asking him—a former political rival, a member of the opposite party, to eulogize him. It made me laugh out loud when President Obama mused that perhaps some of the reasons that Sen. McCain asked himself and Bush 43 to speak at his funeral, even given the fact that they had both sparred with him politically, were that Sen. McCain liked being unpredictable, even contrarian—but also demonstrated Sen. McCain’s generous sense of humor. 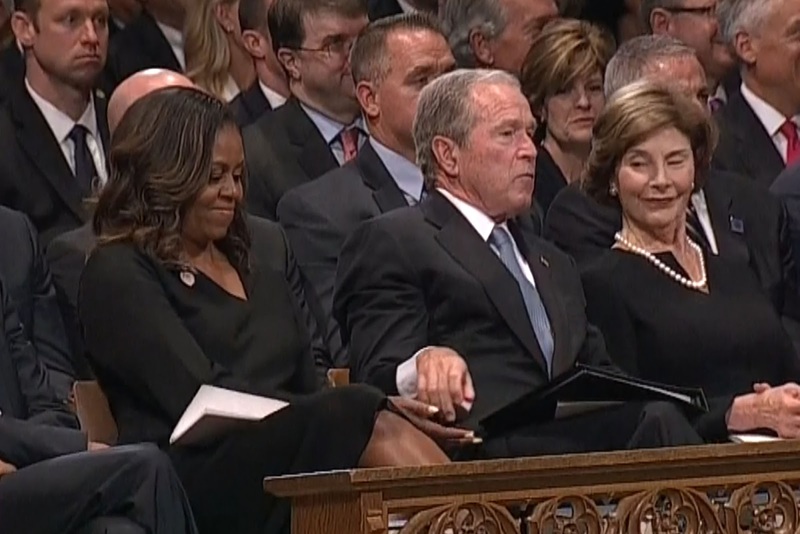 And when the camera panned to President Bush laughing and nodding with Michelle Obama, they laughed again. 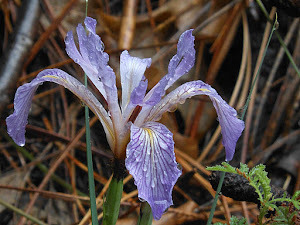 Yet, this anecdote is also an example, a gentle, good-humored one, of the integrity the author of James is calling us to embody in the use of our words, and in our actions. And even though one of my priestly mentors once cautioned me to avoid the word “should,” it’s hard to talk about the ethics of faithful living at times without using it. We should be able to disagree and still respect each other, and even perhaps like each other. We should be able to see the good in others even if they are different from us. Even in death, Senator McCain embodied that kind of integrity. And we know that that integrity came from his own deep faith. A faith we too share. A faith that we are called to emulate, again and again, even when—especially when—it’s hard. As Jesus reminds us, it’s what comes out of us that defiles us or makes us pure. 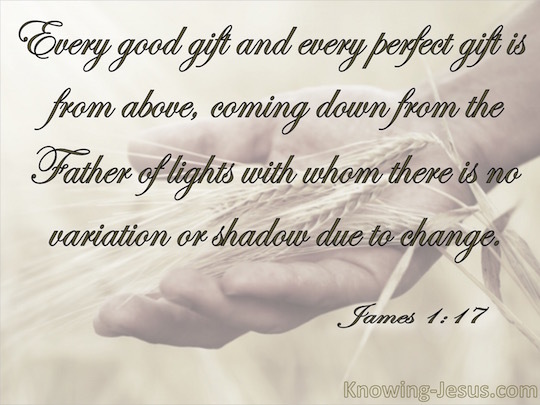 By cultivating habits of generosity and gratitude, it makes it easier for us to embody the values Christ himself embodied, the values God implanted into us as reflections of God—and it also makes life itself more beautiful, more fulfilling, more just and peaceful and satisfying. The human heart is a marvel, and also can be a weapon. It’s up to us how to use those hearts we have been given. May we use them to build up each other, in generosity and faith, for it is then that we together will produce abundantly more than we ever thought we could. Preached at St. Martin's Episcopal Church, Ellisville, at 8 and 10:15 am, on September 2, 2018. 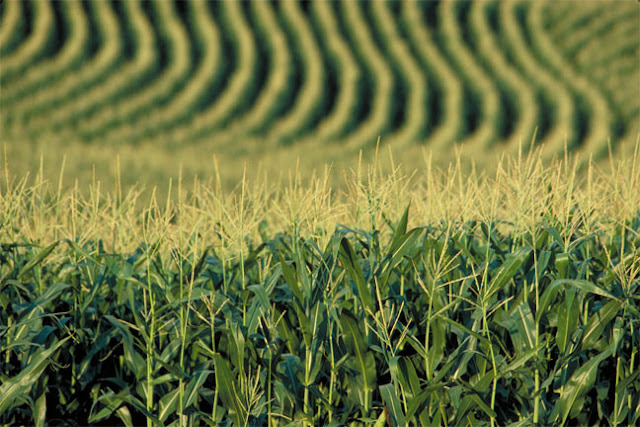 1) Cornfield in Oklahoma, from the Oklahoma Farm Report. 6) The Obama, Bush, and Clinton families at John McCain's funeral at the National Cathedral, September 1, 2018. 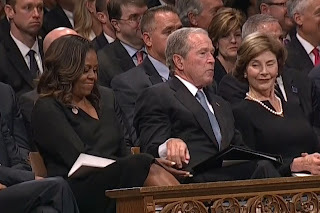 7) George Bush shares candy with his friend Michelle Obama at the McCain funeral as Laura looks on-- so sweet!